A 10-year-old girl who was treated for pneumonia at West Cumberland Hospital has written to the Prime Minister asking for his help to save some of its services. 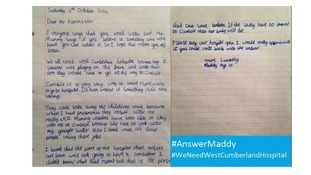 Maddy Snell heard about plans to move some services to Carlisle, 40 miles from Whitehaven, and when her mother said she was going to write to David Cameron, Maddy wanted to write too. "We all need West Cumberland Hospital because say if someone was playing in the park and broke their arm, they would have to go all the way to Carlisle. Carlisle is a very long way to travel, especially to hospital." And she's determined for an answer from the Prime Minister. "Everyone says you won't listen, but my mummy says if you believe in something and work hard you can achieve it, so I hope it means you will listen,"
Her mother, Emma-Jayne Gooch, told ITV Border how proud of Maddy she is. "I am extremely proud of Maddy. I am delighted by what she put in, and she really hopes he will listen to her. Three years ago, Maddy had pneumonia, and was treated overnight at West Cumberland hospital and they were great, and I was able to stay with her. I have another daughter so it would have been very tricky to take her to Carlisle." Health officials say they understand the concerns of the people who demonstrated in west Cumbria last night but say they need to ensure services are safe and save lives. The North Cumbria NHS Trust says only high risk operations have been moved, because of a lack of qualified staff in Whitehaven, and mortality rates have fallen as a result. David Cameron has been in the south of Scotland today making the case for a "No" vote in the independence referendum. It was the second day of his campaign tour north of the Border ahead of September's vote. The Prime Minister met pupils from Lockerbie Academy to hear their views. And in an exclusive interview for this programme he promised the Tories would give Holyrood more powers if Scots reject independence. The Prime Minister has been in the south of Scotland today, campaigning for the Union. He visited Lockerbie Memorial and spoke to young people from Lockerbie Academy about September's independence referendum. Afterwards he told our Political Editor, Peter MacMahon, the Tories will promise to give Holyrood more power if there is a "no" vote in September. 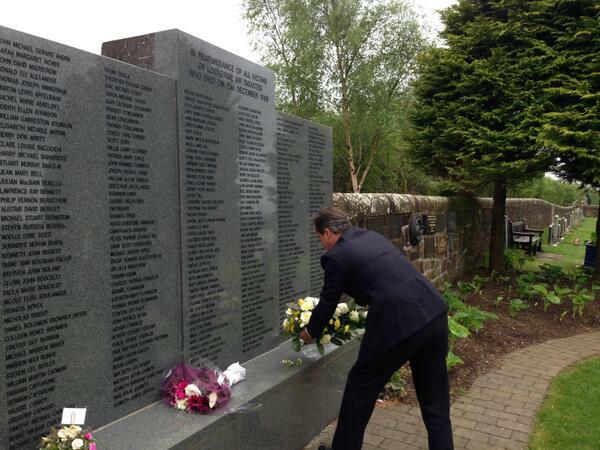 David Cameron has been in the south of Scotland today to campaign for the Union ahead of the independence referendum. The Prime Minister met pupils from Lockerbie Academy for a question and answer session. 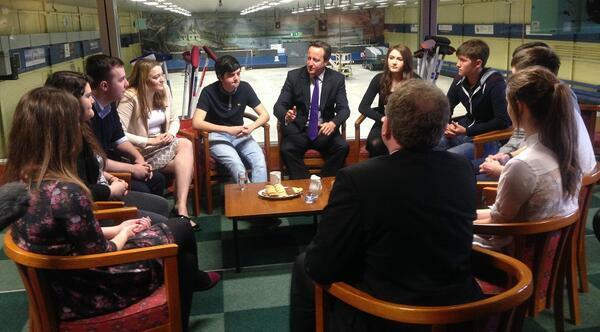 David Cameron is at Lockerbie ice rink to speak to young people about the Scottish independence referendum. The Prime Minister is in Dumfries and Galloway today as part of a Scotland wide visit. David Cameron is expected to meet local school children and discuss the implications of young voters in this year's independence referendum. The Prime Minister will deliver an Olympic themed speech as he urges Scotland to remain part of the UK later today. At the Olympic Park in London, David Cameron will argue that the whole of the UK will lose if Scotland votes for independence in the referendum. The Prime Minister has also criticised high payments to public officials following reports of a large severance deal being given to the Chief Executive of Cumbria County Council. 55-year-old Jill Stannard is retiring early from her post, which has a salary of £170,000 a year.